1. Prepare the lamb rack by trimming most of the fat off and brushing with about 1/3 of the oil mixed with the honey. Sprinkle with salt and pepper and rub with the herbs. 2. Heat 1/3 of the oil in a skillet and brown the lamb in it. 3. Transfer into a pre-heated oven at 350°F and cook for about 20 minutes. 4. In the meantime, heat the rest of the olive oil in a pan and add the shallot or onion. 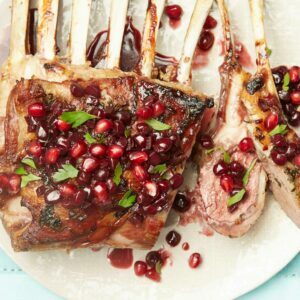 Cook for 3 minutes or until translucent; add the pomegranate and wine and cook on high for 2-3 minutes. Add the broth, lower the temperature to medium and simmer until the sauce is reduced to about half. 5. Serve the lamb with the sauce and sides of roasted butternut squash (or potatoes) and sautéed greens. By Alessandra Rovati, for Joy of Kosher with Jamie Geller Magazine..